Work on a new bike trail in Penrose is expected to wrap up this fall. 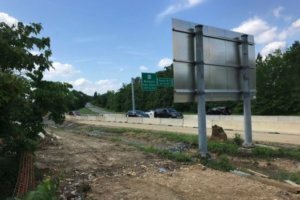 Work is speeding ahead on a new bike trail running alongside Washington Blvd as it meets I-395, with construction set to wrap up this fall. The county has spent close to a year constructing a new 10-foot-wide trail as the road runs between Towers Park (801 S. Scott Street) and 2nd Street S. in Penrose, in a bid to provide more seamless access for cyclists and pedestrians to a previously constructed trail between Arlington Blvd and Walter Reed Drive. Over the course of the last month, the county says workers have finished “two sections of retaining wall” and the “installation of the abutments for the bridge over the Doctor’s Run stream,” as well as the construction of some storm drains. Now, work will shift onto property owned by the U.S. Navy at 701 S. Courthouse Road, just near Towers Park, as workers install the trail’s stone and asphalt base. Work hours are Monday through Friday, 9 am to 3 pm. Night work is expected throughout the project and will take place between 10 pm and 5 am (these hours will occasionally be extended). Partial lane closures will be in place at night, reducing traffic on Washington Boulevard to one lane in the southbound direction. There will be no impacts to northbound traffic.